You are here: Home / Beekeeping / Honey Bee Pollen – A (Beneficial) Natural Super Food! pollen are the male seed of a plant and for bees it is the major source of food. If you think bees only need nectar, water and pollen to survive and thrive. And it amazes me how many work is done within a bee hive, pollen can surely be seen as a superfuel for bees. Honey bees collect and carry bee pollen on their back legs. The honey bee can carry up to 15 mg of pollen on one flight and two granular of pollen can contain up to 2 million pollen. Pollen are light and when the pollen are put in the comb for storage some pollen can float around in the hive and land also in the honey. If you buy honey from your local beekeeper it is quite normal the honey contains pollen. The amount of pollen in honey can differ, but if raw local honey is bought, the pollen count can differ from one to five million pollen. This is just as many the worker bee can take with her on one flight. Pollen are the most important source of nutrients for the bees. Pollen contain protein, carbohydrates, lipids, vitamins and minerals. This is also what humans need to become strong and healthy. Pollen are the only protein source that bees depend upon, a big diversity in pollen of different plants are important for a strong bee hive. Bees digest the proteins with enzymes and break the protein down into smaller building blocks called aminoacids. The bee will use these amino acids, to build the necessary building blocks to replace old cells and stay a healthy bee. Every species of plant pollen are quite diverse in composition. Please be aware when taking in pollen the consistency can not be guaranteed. Because the bees never bring home the same consistency. So if you consume pollen, only take it as a supplement because pollen lack the diversity in amino acids to be a primary food source for us. Pollen first needs to be processed to make it a good food source. The outside pollen are a hard barrier that first needs to be broken to reach the dense nutrient core. When bees store the pollen in the wax cells, the bees moisturize the pollen with enzymes and bacteria from the honey stomach. The pollen are fermented for 14 days after which it becomes bee bread. The worker bees consume the bee bread and can produce the famously known royal jelly with their hypopharyngeal glands, worker bees do produce also other nutrient rich substances to feed the larvae. After the larvae becomes a young worker bee, it starts to feed itself with the bee bread, which stimulates the hypopharyngeal gland growth. These glands are important to produce royal jelly and feed the larvae. Larvae are constantly fed by worker bees and need in the first six days of their life high quality food to develop into strong and sufficient bees. Worker bees process the pollen and give the larvae food. If there are no sufficient pollen available the larvae will have a shorter lifespan. Also the type of pollen fed to the bees can have influence on the lifespan of the new bee.Sp nutrition is a major factor for sustaining a healthy hive, when different diseases accumulate and malnutrition continues it can be bad news for the honey bees. Also diversity of flowers is important, pollen from different flowers contain nutrient compositions. Pollen are the main Protein source for bees and also the main ingredient for a healthy bee hive. The protein range in pollen can differ from 7 percent (spruce) up to 62 procent (primula). 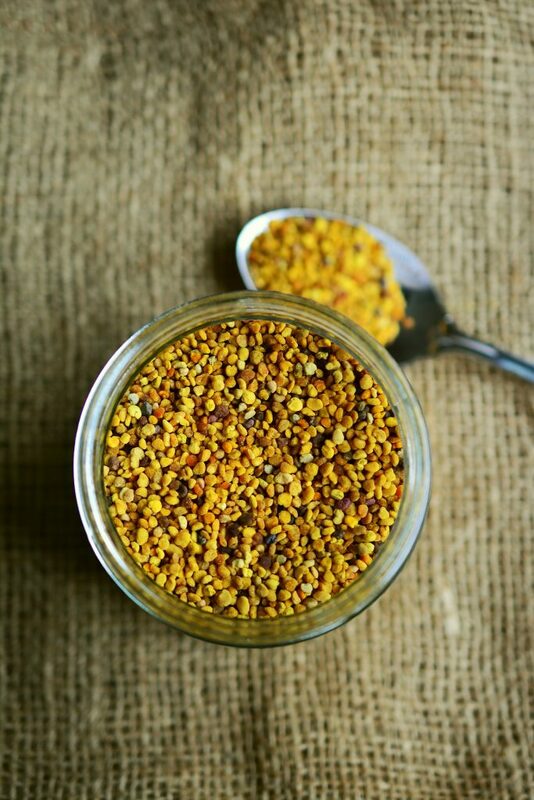 You can imagine a variety of bee pollen is just as important as a diverse food diet for humans. Every different plant has different flowers and which contains it’s own unique nutrient composition. When I started beekeeping I had little knowledge about when and which flowers were blossoming. But as i started to watch the bees, they were carrying all kind different bee pollen with all different colors. So I highly recommend when you have time to take a visit to a local beekeeper ask if you can look by the hives. Be silent for a minute and look at the hive entrance, you will notice bees entering the hives with all kind of colors of pollen. Click here to go to a wikipedia article with a reference list of different pollen sources. As per above tables it is quite clear that pollen contain a lot of nutrients. In tropic and sub tropic cultures it is a important part of the diet of people. The available nutients in the pollen fulfill a important role in the good functioning of our immune system and can build up resistance against pathogens. Bee pollen can be used as dietary supplements and against numerous other problems. Harvest and preservation of bee pollen. The pollen which are mostly available in the store are not processed further by the bees. Pollen are carried on the rear legs of the bees and are carried overinto to the hive. At the hive entrance the beekeeper installs a pollen trap installed which collects the pollen of the bee. The pollen trap do not harm the bees, when the bees enter the hive they go through the pollen trap. Worker bees have to pass a grid which has the same with as the bees. The pollen on the rear legs are scraped off the legs and fall in a compartment where the pollen are collected. Beekeepers must always be aware they do not use it more than a few days. Bees need the pollen themselves to build a strong hive and the beekeeper is responsible for sensible use of the pollen trap. When pollen are collected, there is a limited timespan to get them preserved. the moisture content in pollen is still too high and excess moisture must be removed from the pollen. Otherwise pollen can be consumed by mites, insects or fungi, and some fungi can release toxins which can cause health problems. Pollen must be dried to a moisture content below the seven percent, this can be done by drying the pollen at 40 degrees C. During storage it is best to preserve the pollen at a dry, dark place in a water and air tight container. When purchasing pollen you should check on the diversity in color. As mentioned above different flowers have different nutrients concentrations in their pollen. On the package there must be the address of the producer, expiry date and batch number. On the market there are three main products available. First is and most familiar is Granular pollen, the pollen can are harvested with pollen traps and can be bought in containers. Granular pollen which are available in the store are often exported from foreign countries, such as spain, china or the united states. If you want local pollen you should contact your local beekeeping club and they can help you in the good direction. Also it is recommended to buy other bee products from local beekeepers, by spending a little extra you can often help your local bees at the same time. Second product available is honey mixed with pollen, pollen are mixed with the honey, mixed ratio is often 95 percent honey and 5 percent pollen. Normally this type of honey is not regularly available and you should ask it to your local beekeeper. Which will be happy to help you, please ask this in advance early in the season so when he harvest the honey he can prepare it. Off course you can also do it yourself. Just buy regular granular pollen and mix it with the honey of your preference. And the third product is the so called bee bread, most people are not familiar with it. But bee bread is the kind which is processed by the bees. When bees store the pollen they put a little honey from their honey stomach to the pollen. In the stomach lives lactic acid bacteria, which also come into contact with the pollen. The lactic acid bacteria need about 14 days to ferment the pollen to bee bread. Bee bread is available in stores but has a very small market. Harvesting bee bread is a labor intensive activity, because the beekeeper must spoon the pollen out of the wax cell one by one. When researching this article I was a little surprised it actually can be bought. Always be aware of the destination of origin pollen can contain heavy metals and pesticides (harmless in small quantities). I have a small side note to make; please understand me right I do not want blame anyone, but most people expect the pollen are organic and residue free. Bee pollen is a real nature product and products from nature can reflect on how we take care for nature. Although there is a good change ongoing, the majority of the people are still killing their weeds with chemicals and in modern agriculture there is also a high use of pesticides and chemicals to kill off insects and weeds. These chemicals will eventually end up in our food. So care for the bees and seed some flowers in your garden. Also keep in mind when buying plants, nurseries often spray them with chemicals in advance. Always check if the plants are not sprayed with pesticides. These can eventually come back in our own food. If we take care of nature, nature will give back in plenty more ways. Granular pollen are my preferred choice for consumption, these are widely available and can be easily digested. You can easily add them to yoghurt, dessert, sandwich or any other preference. Be aware bee pollen must be used as a dietary supplement and not as food source. It is recommended to build up pollen use, to avoid any allergic reactions. When starting consumption of bee pollen. It is recommended to have a first dosage of only 1 – 2 granulars. And slowly build it up in the coming days, this way you can anticipate if you are allergic to bee pollen, in case of any allergic reactions contact your doctor. Otherwise you can build up consumption in the coming days and weeks. Most adults consume a spoon full (10 grams) each day with a max of 30 grams. Be also aware high consumption of bee pollen is only recommended for a short period of time (1 – 2 months). Always take your own safety in mind. – Bee pollen are the main protein source for bees but also contain carbohydrates, lipids, vitamins and minerals. – If you buy pollen always check the label on location, expiry date and batch number. Preffered is to get local pollen from your own area. – On the internet pollen are seen as a super food; but always be aware, use pollen only as a food supplement because the consistency and composition can differ in each product. – Always keep your own health and safety in mind, talk to a doctor in case of any doubts. – Pollen can contain heavy metals and pesticides, although these are small quantities be aware on the origin of the product.